Healthy Pineapple Banana Smoothie is always a healthy choice year-around. This smoothie is a perfect blend of pineapple and banana mixed with almond milk. It works well with other fruits and vegetables. No sugar added. It is so refreshing, especially if strawberries are added to make a healthy pineapple banana strawberry smoothie. The possibilities are endless! Savory Thoughts: Starve your distractions. Feed your focus. I ENJOY refreshing drinks! Especially those that are really to make in a matter of seconds; like my carrot ginger apple juice. I don’t know about you, but I love spring as it is a clear indication that bright, warm sunny days are on the way. More of a reason to enjoy tropical smoothies. With this recipe, you can even make it an easy pineapple kale smoothie simply by just adding kale. 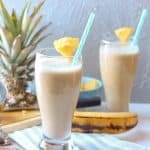 How To Make Pineapple Banana Smoothie? With just a few ingredients, you’ll have breakfast in a cup or an afternoon “snack” in a matter of minutes. 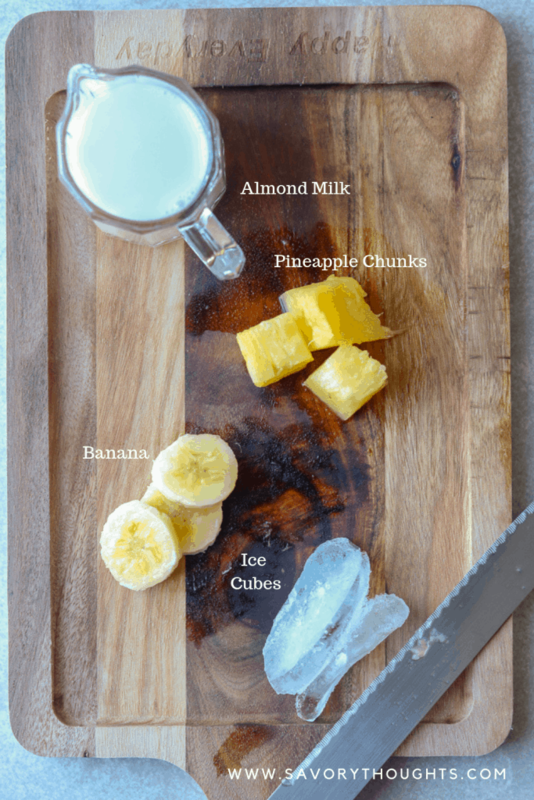 Below are the ingredients you’ll need to make this super easy, delicious Pineapple banana smoothie right in your Vitamix or preferred blender. Bananas; I recommend using bananas that are yellow, preferably the ones with the black spots because they have a sweeter taste. Fresh pineapples; frozen pineapples works just as well. Almond milk. Coconut milk will work too. Vanilla extract. This will help enhance all of the flavors in the smoothie. Ice (optional); I decided to add ice to the smoothie. However, to make it thicker, please feel free to not include the ice. 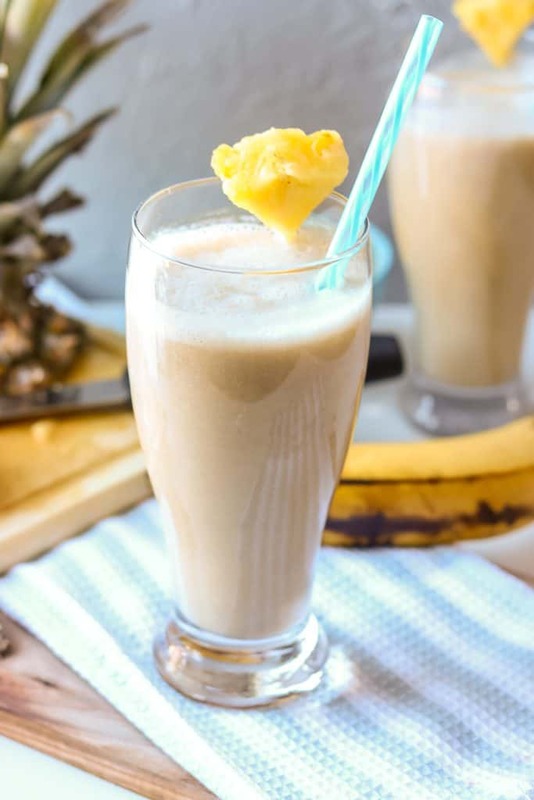 Did you make this Healthy Pineapple Banana Smoothie recipe? Tag me on Instagram or Facebook and please give it a star rating below! 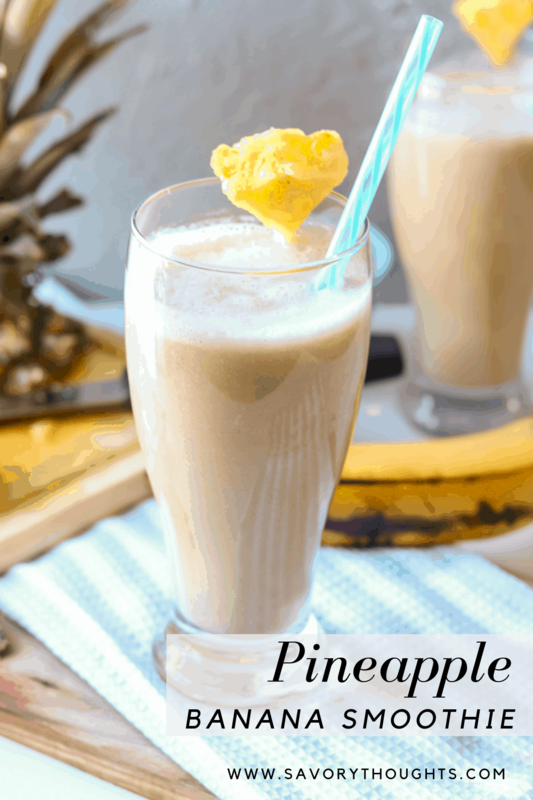 SAVE THIS PINEAPPLE AND BANANA SMOOTHIE TO YOUR PINTEREST BOARDS! Easy Breezy Healthy Pineapple Banana Smoothie. Perfect year-around tropical drink. A great blend of pineapple and banana mixed with almond milk. Works well with other fruits and vegetables. No sugar added. It is so refreshing, especially if strawberries are added to make a healthy pineapple banana strawberry smoothie. The possibilities are endless! Add all of the ingredients into the Vitamix or preferred blender. Do you need to add ice? Nope, no you don’t. Not adding ice will make it thicker; however, adding ice will not hurt either. If you are looking for a creamy, thick consistency, adding yogurt will definitely help with the consistency and easily turn this recipe into a pineapple banana smoothie with yogurt recipe. Can you use frozen bananas? Yes, you sure can. I have used frozen bananas and fruits from time to time to make various version of this smoothie. If you find that the smoothie is not as sweet as you would like, adding honey will also help sweeten the smoothie. Can you use canned pineapples? Yes, although in my opinion fresh is always best. Moreover, incorporating strawberries to make a pineapple banana strawberry smoothie will work as well. The smoothie can also be enhanced by adding mango, peach, and pears. All of these fruits go well with this pineapple banana smoothie recipe. If you are following the whole30 diet. I recommend that you do not include the honey but include other fruits to help sweeten the smoothie. Which milk to use? You can use any milk you would like. For this recipe, I used almond milk. It also works well with coconut milk. I literally have everything I need to make this smoothie and I’m definitely going to make this for my breakfast today! It sounds refreshing and delicious! This is my kind of smoothie! It’s like sipping on a tropical drink! LOVE it. I love easy smoothies like this that you can easily adapt too – I often use banana and pineapple as a base for green smoothies. I love bananas and usually always have them on hand so this is going to be awesome to have in the morning! So easy and refreshing looking too. The perfect way to start my day. This smoothie is everything I need. Love the combination and how tropical feels it is.